Barry Goudreau is the ex-lead guitarist for the band Boston and is now slinging solos with Barry Goudreau’s Engine Room. This tremendously talented artist is one of the best six stringers around and his classic playing on many of Boston’s famous double lead riffs makes him one of the all-time greats. Goudreau is a guitar god and this is what he has in store for us mere mortals. Noise: Who’s in your new band and what does each member bring to the table? Barry Goudreau: When I decided to go ahead with a new band and recording project the first (and only) people I contacted were my former RTZ band mates Brian Maes and Tim Archibald. Brian played keyboards and contributed some of the most popular songs on the RTZ CD. This time he’s co- writer, co-producer and lead singer. Tim, of course has been named “Best Bass Player in Boston,” the city not the band, many years in a row. The band is filled out with “Old” Tony DiPietro on drums, a long time friend and band mate of Brian’s. After recording several songs, Brian and I decided to try using female voices for back- up vocals. We enlisted Brian’s wife Mary Beth, as well as Terri O’ Soro and Joanie Ciccatelli and were so impressed with the results that we used them on most of the cuts on the CD. They join us on tour as well. 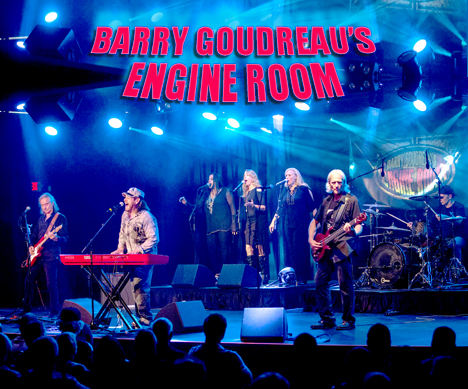 Noise: Barry Goudreau’s Engine Room just released your first CD Full Steam Ahead. What do you like about it and what should people listen for on it? Goudreau: With this project I wanted to re-visit the bands that got me fired up in the late sixties and early seventies with the blues kicked up with big drum and guitar sounds. Think Cream, Humble Pie, Delaney and Bonnie and Joe Cocker. The tracks run from the straight blues of “All Mine” to the hard rock of “Need” with a little bit of both in between. The song “Reason to Rhymn,” the first thing we recorded, is the closest thing to classic rock on the CD. Noise: In one word how would you best describe this group? Goudreau: The one word I would use to describe the band is the most important thing to me now – fun! Noise: You have been the great guitarist in Boston, Orion The Hunter, RTZ, Ernie & The Automatics and now with The Engine Room. In your live show today do you play any music from these bands or is all the focus on today’s new originals? Goudreau: For the first time I’m performing a live show that touches on all aspects of my career. We play some Boston material, “Dreams” from my solo record, “So You Ran” from Orion The Hunter, “Face The Music,” “Until Your Love Comes Back Around” and “Rain Down” from RTZ, “The Rhytmn Won’t Stop” from Delp/ Goudreau as well as the new record. Noise: You were born in Boston and went to Boston University in the 1970s. What was the local music scene like in those days? Any cool stories about seeing any groups back then? Goudreau: I graduated high school in 1969 and attended Boston University. A friend of mine from high school was across the river at M.I.T. and suggested we start a band, just for the fun of it. We played at his frat house’s toga parties but rarely made it out of the frat house. We were not part of the local music scene. I did attend some great shows during that period including Led Zeppelin’s and Jeff Beck’s first shows at the Boston Tea Party. I saw the Allman Brothers Band with Duane on guitar with Steve Miller and Sha Na Na opening. When I saw Cream it inspired me to buy my first Gibson SG guitar and Marshall amplifier. Great music scene. Although I didn’t know them at the time, my now good friends James Montgomery and “Skunk” Baxter were in local bands while attending B.U. and making some noise. Noise: You won the Tom Scholz trademark infringement law suit where he tried to prevent you from using the band name Boston in your current promo ads. In a nutshell, care to share your reaction to all the years of legal action resulting in your final victory? Goudreau: After being sued twice for trademark infringement, the third case against me went to trial in Federal Court last fall. I sat in the same witness seat and before the same judge as “Whitey” Bulger. After a week long trial, in front of a jury, Tom Scholz lost his case against me. It was a relief after nearly ten years of litigation, but short lived. Tom has since filed for an appeal of his loss, which will probably keep the case going for two more years. Noise: You also released a few albums with Brad Delp. What do you think his legacy in the music world is? Goudreau: Brad Delp was one of the best rock ’n’ roll singers ever. It’s great that his voice can be heard almost every day all over the world singing Boston’s hits. He and I did several projects together with some success. It’s too bad that he didn’t leave any music of his own making. Noise: Drummer Sib Hashian and you had been in bands since you were fifteen years old. Recently, you were on a booze cruise with him when he passed out mid set while drumming and died. Please tell my readers what happened? Was Sibby feeling bad at all in the days prior or was this as sudden death as you can get? Goudreau: Sib and I were best friends from the time I met him when I was 15 through all the twists and turns our careers took us through. Sib had a medical scare back in the fall when he was diagnosed with kidney cancer. He had a kidney removed and was cancer free without having to go through chemo. We had been appearing on a cruise for several years and looked forward to it since it was essentially a paid vacation for us and our wives. We rehearsed for the show several times before leaving and he was fine. We were on stage four songs into our set and it was going great. Sib was introducing the songs as only he could do with a smile on his face and playing great. After the song ended, he was hunched over his snare. I went back to see what was up and saw he was in distress. I put down my guitar, moved the drums out of the way to get to him. He was on the floor at that point. When I looked into his face I was shocked to see him grey and not breathing. A doctor and a nurse in the audience administered to him to no avail. The Italian run cruise line did little to help since they didn’t have a working defibrillator. We had to stay three more days on the ship before returning to the states. I don’t think I will ever be able to go on a cruise ship again. We all miss him dearly. Noise: What’s in the future for Barry Goudreau’s Engine Room? Goudreau: The Engine Room is playing shows in the region to get the band established and to grow a following. I am thoroughly enjoying it and expect the band to go on to future recordings and shows. Show listings can be seen at:barrygoudreausengineroom.com or on Barry Goudreau’s Engine Room FaceBook page. Noise: Any advice to young guitarists trying to make it in today’s tough music world? Goudreau: I think my only advice to up and coming guitar players would be to first love what you are doing. There is no downside that way whether you are successful or not.